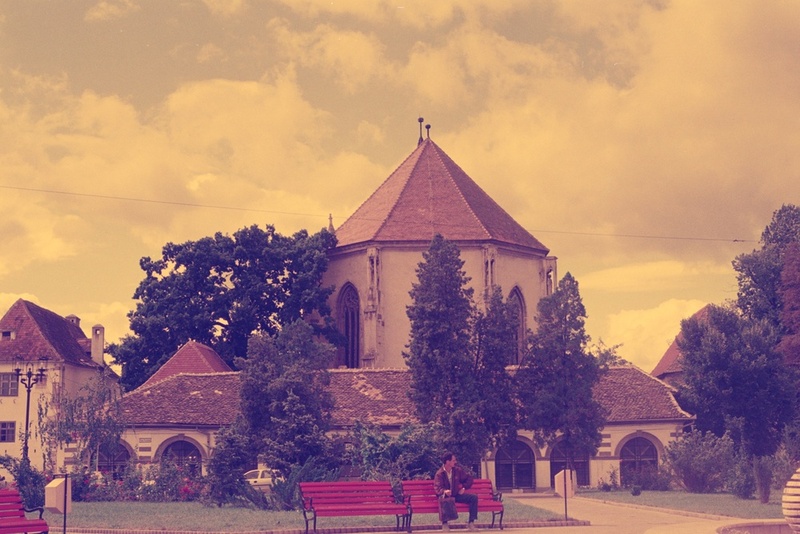 The city formerly known as “Saxon Sebes”, now merely Sebes, was one of the most important urban settlements of medieval Transylvania, and the numerous vestiges of its long history still make it, today, a most picturesque and attractive tourist destination. Located in the southern half of Alba County, the city that now counts roughly 28.000 inhabitants started as a Saxon colony in the XII century and withstood vicious attacks from both Mongolian and Ottoman invaders. Many of the city landmarks that visitors can admire today bear witness of just how successful it was at defending itself against such enemies. Perhaps the most imposing of these landmarks – as old as the city itself – is the Evangelical Church, which manages to artfully combine various features and structures pertaining to different architectural styles. First erected as a Romanesque basilica, it started undergoing significant changes as early as during the second half of the XIII century. Its nave, narthex and atrium were brought together under one roof, the Romanesque choir was replaced with a Gothic one – famously decorated with pointed arches – and the two towers guarding its entrance were replaced by a single one, which now stands 40 m high. Another strong element of the Gothic style is visible in the smaller, pointed arch windows that replaced the old ones. Then, during the XV century, the church was surrounded with a high defensive wall complete with fortifications. The deceptively simple exterior stands in sharp contrast with the interior, richly decorated with paintings and sculptures and boasting a polyptych altarpiece 13 m high by 3 m wide. As far as sight-seeing goes, the Sebes area, while a wonderful destination for history enthusiast, offers other attractions as well, two of the most remarkable ones being the “Rapa Rosie” Natural Reserve and, for those with a mind for more modern distractions, the golf course of Pianu de Jos. 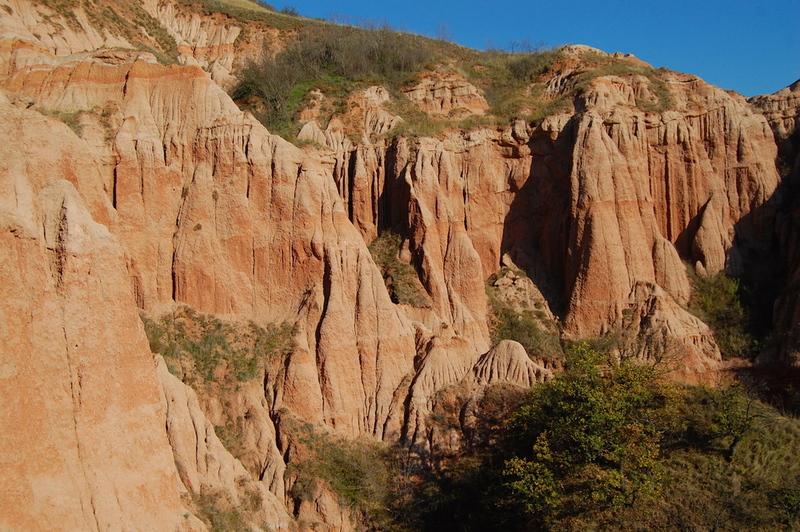 The “Rapa Rosie” Natural Reserve, which is almost within walking distance from Sebes (about 4 km north of the city) is a 10 hectares geological and botanical reserve with spectacular rock formations – mostly columns and pyramids – eerily similar to the “badlands” of South Dakota, US. One of its most impressive features is a huge, organ-like, red stone wall, so steep that it is almost vertical. 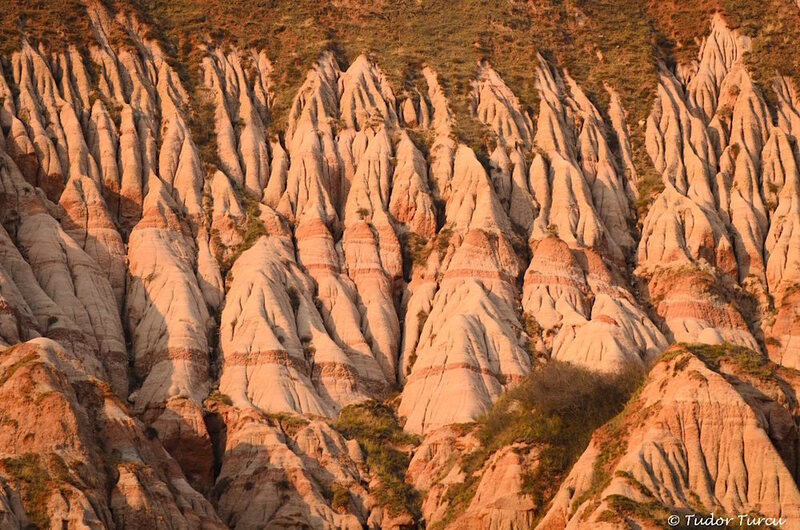 Due to its geological composition – mostly alternating strata of red shale and grey and red sandstones – the landscape changes slightly with each heavy rain that cuts and dissolves through the rocks, reshaping them into fantastic looking structures.